Search engine is a big business, just talk a look at revenue and profit generated Google. But if you want to take a slice of share in search engine market, your search engine will have to beat Google, or else it will have to specialize in a niche, such as regional search engine such as Baidu. The later is probably on the mind of Wolfram in the creation of Wolfram. 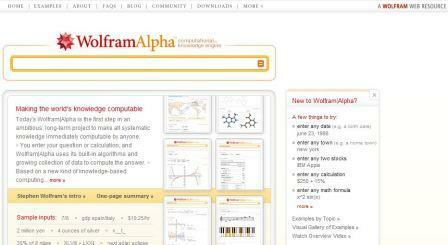 Albeit initially hope to be a Google killer, Wolfram now calls itself computational knowledge engine. Currently, much of the core of Wolfram is based on Mathematica, the computational software program used in scientific, engineering, and mathematical fields and other areas of technical computing which is also developed by Wolfram. Wolfram also makes extensive use of the latest generation of web and parallel computing technologies, including webMathematica and gridMathematica. As the result, now Wolfram has 10+ trillion of pieces of data, 50,000+ types of algorithms and models, and linguistic capabilities for 1000+ domains. Thus, Wolfram is excellent in returning results for computation type of query, the scope of the search engines are large though. It covers topics such as mathematics, statistics & data analysis, physics, chemistry, materials, engineering, astronomy, earth sciences, life sciences, technological world, transportation, computational sciences, web & computer systems, units & measures, money & finance, dates & times, places & geography, socioeconomic data, weather, health & medicine, food & nutrition, words & linguistics, culture & media, people & history, education, organizations, sports & games, music and colors. More example can be read here. Unfortunately, Wolfram appears to be still having problem in understanding natural language and free form input. Anyway, for those who forget to bring calculator, and only has web access, Wolfram provides easy solution. Visit Wolfram at http://www.wolframalpha.com/.